While horse poop tends to be a necessary evil during town parades, the Hailey Rotary Club found a way to turn dung into dollars. This Friday, July 4, the club is hosting their annual Road Apple Roulette charity event during the Fourth of July Parade in Hailey. The parade route is cordoned off into 10,000 squares via GPS satellite that are each given a number. If during the parade a horse should drop a “road apple” on the square you purchased; your name will be entered into a drum for a prize drawing. Squares are $5 each and you can purchase as many as you like. Numbers are randomly assigned when you buy tickets. Your name will be entered for each of your squares “graced” by a horse dropping. Some of the spiffier prizes this year include a weeklong stay in Mexico, a season ski pass, a $500 dollar Valley Co-Op gift certificate and a Weber gas barbecue grill. The largest portion of the roulette money goes to scholarships for Blaine County high school seniors. The fundraiser benefits mostly local organizations with a few far-reaching groups receiving donations as well. Wood River Family Connection, the Wood River Arts Alliance, the Blaine County Museum, the Rotarun ski area and the Sun Valley Ballet School are a sampling of other local recipients. International recipients include an Argentinian exchange program, scholarships for Club Rotario de Cabo Este and the Bahia Water Project. The Rotary Club is a 109-year-old organization that began in Chicago and quickly went international. The club donates almost 90 percent of funding toward program investments, according to their website. Their money is generated from members, outside donors and market investments. Fundraising takes a little less than 10 percent of their budget and administrative expenses are at 2 percent. After last year’s roulette, the rotary raised $55,000 from sponsorship and ticket sales, according to Hailey Rotary Club President Kathleen Eder. Seniors from four local high schools received $25,000 in scholarships from that fund and some $5,000 was awarded to students at the College of Southern Idaho, she said. Tickets can be found at business establishments throughout Hailey and Bellevue or online; visit roadappleroulette.org/tickets to purchase. You don’t need your ticket stub to win, but you can pick it up at JML Publishing on Hailey’s Main Street during normal business hours. 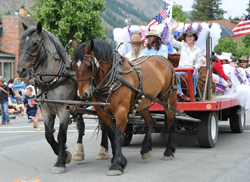 The parade starts at noon in downtown Hailey.